The first words that I heard this morning when I woke up was a small whisper saying: "Mommy. I need Holy Water." This was in the wake of Sadie's concern earlier in the week when she discovered that we were out of Holy Water and ran up to me and said: "Mommy, Daddy needs to go to the store and get Holy Water!!!! in a panicked tone. I told her we don't buy Holy Water at the store, Daddy could just go next door to the chapel and bring some back, but she still raced out and told him in an equally alarmed tone that he needed to go buy some at the store, in a tone that indicated that it needed to be done right away. Our Holy Water fonts are a pretty new addition to our home and Sadie seems to think that they're absolutely wonderful. I first thought of ordering the fonts when Sadie began having her nightmares. They stretched on, nightly, for months and the subject was always the same... the "new baby," and specifically, as far as I could tell that the new baby wasn't with "mommy." We talked about the new baby being in heaven with Jesus and Mary, we prayed that she would not have any bad dreams, and we'd tried ignoring the subject, but nothing was working. I remembered reading somewhere that some families would have the father bless the children with Holy Water before bed and many of the people in the comments section of that particular article, that I can only vaguely remember, had said they did the same thing with their children and that nightmares largely disappeared. So we decided to give it a try. I went through Ebates to the Catholic Company (5% back on anything you order, and since I was buying them anyway... yeah... I'm totally hooked...) and found two that were beautiful. I ordered the Our Lady of Grace font for Sadie's room and I ordered the Holy Family font for our entryway. 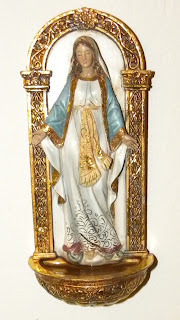 The Holy Family font was originally backordered, so the Our Lady of Grace font arrived first, and Sadie was thrilled. I put it on our little home altar to wait until I'd bought strips to hang it, and Sadie war frequently found swiping it off the altar and carrying it carefully around. One day I found her in her room, with the font on a shelf, praying beside it. Once it was hung and filled with holy water, Paul began blessing each of the girls each night before we said our family rosary at bedtime. Sadie hasn't had a nightmare in over a week. She did wake up and get out of bed the other night to come get me when I was sewing, something that's never happened before. In the past she always woke up screaming in terror. So for her to silently get up, without waking up her baby sister, and walk across the dark room to find me was a big step in a good direction! The font also means that she loves to run and reach up and dip her fingers in it and make the sign of the cross. She also crossed herself, without prompting, yesterday when we walked in past the chapel on our walk. And of course, she loves to go around making the sign of cross on other people too, afterwards proudly saying: "I blessed you Mommy!" My heart swells when she says those words and I must admit that I do feel very blessed! I always recommend holy water for nightmares. It works for adults too! We have beautiful Holy Spirit fonts, but we usually forget about it before bedtime. Thanks for the reminder! That is so wonderful that you have several holy water fonts in the house. Your blog post on this is so timely for me because I have been thinking my Little Tiger could use some Holy Water before bed due to nightmares as well. I'll make sure I add it to my to do list so I remember to do it! I'll just chime in on the 'it works!' comments and say 'it works!' as well. My littlest guy was simply plagued with nightmares, and after blessing him every night the nightmares/fear diminished slowly over a period of time. He was quite a bit older and had been plagued for a couple years though. However, about three weeks ago (after we moved, again) I got so fed up with a renewal of problems that I started rubbing the water over his entire head & back of the neck (not a lot, of course) for a while. He's fine now and doesn't ask for the water 'all over his head' anymore. Our household 'holy water' font was originally a candle holder that I turned into a font when in RCIA since it was right at the front door already and I never burned candles ~ it was purely for a homey look. 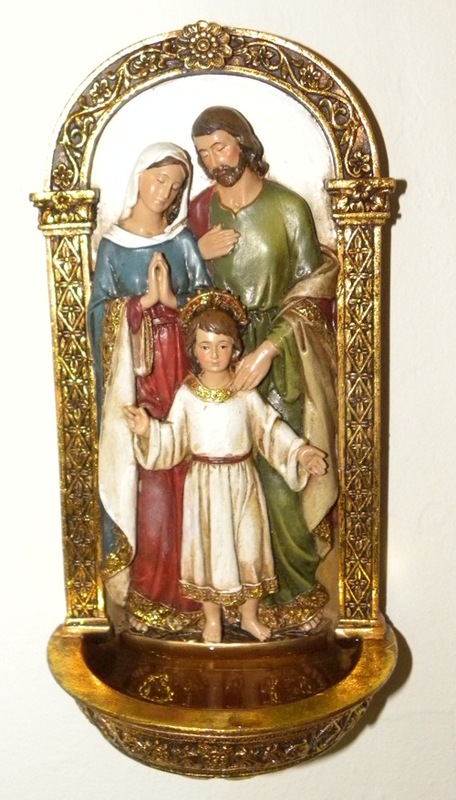 I've been meaning to purchase the Holy Family one for months! I think it is just beautiful! I'll place my order this weekend. I am so glad her nightmares have disappeared. Thanks for the advice re. strips to hang it up - I wasn't sure whether or not they came with a hook. I am hooked on ebates as well! I wish I could say that I've tried holy water for nightmares, but I haven't really had any since at least High School, if not longer. Rough dreams that wake me up, maybe, but nothing truly terrifying. Holy Water ALWAYS feels cold to me. Colder than the ambient temperature of the room. You'd think it would be room-temperature, but maybe I'm just badly attuned, from a sensory perspective. Nothing to do with anything, but Barney Frank is getting married. Care to comment, Cam? Praise the Lord!! You are truly blessed to have two adorable children who love God with all their heart. Hats off to you in bringing our faith to them at this tender age! Have been a silent reader of your blog for a while and I so greatly admire your dedication and perseverance in bringing up your girls in a godly way. So glad the Holy Water is working out well!! !